Before you land upon the island you understand why, because of the pristine landscape and the particular scenery, Alicudi is one of those places where time seems to be stopped. The island, with its particular atmosphere, seems to tell its history, a history made of raids and invasions, a history which saw the succession of different populations, the history with the final result of peace and beauty of the place. Alicudi is a little paradise, a place where man and nature coexist without damaging each other. Still today they move exclusively on foot along steep mule tracks which, from the port, cross the whole land till they reach the peak of the mountain constituting the island. Alicudi, because of its harsh morphology, has no paths or roads crossing its perimeter. The unique paths are situated on the eastern side, and connect houses and cultivable lands. The western side is totally uninhabited and nearly inaccessible; it is crossed by gullies and ancient flows which vertically cut the profile. The mooring occurs at the new pier of Scalo Palumbo, which built in 1990, substituted the old pier which did not permit the landing of the boats of medium and large dimensions. The operations of landing occurred thanks to the marine technique called “rolling”. This technique consisted of reaching the port in a small boat with oars, which loaded persons and goods, in order to land. Adjacent to the harbour area, which could be defined as the centre of the island, there are two groceries, the post office, some other shops of essential goods and the unique beach reachable on foot. Before you arrive to the island, you have to bring cash with you and eventual medicines which could be useful. The total lacking of automated banking, pharmacies and banks, no fashionable nightclubs, pubs, discoes; there is only one hotel and the only bistro bar, two groceries and the newsagent also selling essential goods. This is the fashion of Alicudi: to live on the essential, and the nature’s beauty, to live well with few things. Alicudi gives back all the flavour of an ancient itinerary, a journey full of mystery, a place which knew how to apply the respect for nature and popular traditions with the arrival of the tourism, even if small entities. While visiting the island it is better to place your trust in the guide of people who know the paths well, and remember to always bring with you a torch because the island is not illuminated. The unique plain road is the one that runs alongside the sea and leads to the pier. All the others are steep paths leading to 6 little built up areas, to cultivated zones and the Fossa Gerace, at the peak of the mountain. 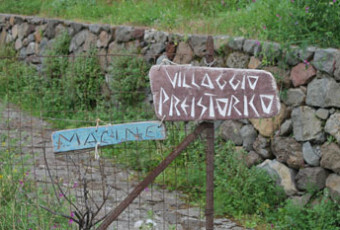 Situated on the western side of the island there is a little built up area of rural houses where you can admire the typical Aeolian architecture: staircases built with dry walls, in order to make the territory cultivable, and the ancient newspaper kiosks of Via Crucis, which attest the islanders’ devotion. San Bartolo is situated 330 metres away from the sea. It is about a road running alongside the church devoted to the patron saint of the Aeolians. It was rebuilt in 1821 upon the ruins of the seventeenth century sacristy. The small town is reachable going all over a paving road which starts from the port. Following the road which climbers up the mountain’s side you arrive to the church of Carmine, immersed into the Mediterranean scrub, which can be recognized for an usual bell tower, separate from the sacristy building. In Pianicello zone , at altitude of 450 metres in the western part of the village, there is a little suburb, whose population’s mother tongue is German. It populates the island nearly the whole year. At the same altitude of San Bartolo, on the eastern side of the village, there is Sgurbio suburb, a small urban built up area compound of only 5 houses, and taking name after the 5 senses. The village situated on the eastern side is isolated, almost inaccessible via earth. This area is reachable, via earth, only thanks to a winding and long path; it is better to reach the village via sea.